The television series Power Rangers S.P.D. (Space Patrol Delta) is a science fiction/action adventure series based on the original Power Rangers television series. It is adapted from the Japanese superhero series, Tokusou Sentai Dekaranger. Power Rangers S.P.D. is preceded by the Power Rangers Dino Thunder series and followed by the Power Rangers Mystic Force series. Power Rangers S.P.D. was produced by Bruce Kalish, Greg Aronowitz and Koichi Sakamoto, and filmed entirely in New Zealand. The pilot episode premiered in the U.S. on ABC Family in 2005. The first twenty episodes of the show aired on ABC Family. The remaining episodes appeared on Toon Disney. The series is set in the year 2025. Alien beings now peacefully coexist with human beings on Earth because of Space Patrol Delta (S.P.D.) - an agency responsible for directing law enforcement over a select portion of space. S.P.D. utilizes Ranger technology to preserve peace and stability throughout the universe. But the era of peace on Earth soon comes to an end, as the formidable Troobian Empire seeks to conquer the planet. After Earth's most powerful defenders, the S.P.D. A-Squad Rangers, suddenly vanish into thin air, the S.P.D. B-Squad Rangers step up to battle the extraterrestrial force. The S.P.D. Power Rangers are a team of top-notch warriors trained by Commander Anubis Cruger at Ranger Academy. The 14 members of the S.P.D. Power Rangers each have their own unique powers. Together, they represent the greatest force for good in the universe. The members of the S.P.D. Rangers are specially trained to fight as a team against the enemies of Earth, and are highly skilled in the use of intergalactic weapons. But when the Red and Yellow S.P.D. Rangers enroll in the squad, conflict arises amongst the members and threatens to destroy their unity. As the Troobian Empire continues to gain power, the S.P.D. Power Rangers must come together to combat the forces of evil. Power Rangers S.P.D. ran from 2005-2006. The season contained 38 episodes. A production of BVS Entertainment and Jetix. In the U.S. the series was shown on ABC Family, Toon Disney and ABC. Each episode lasted 22 minutes and fit into a half hour time slot. The series was distributed abroad by Jetix. It seems there is no hope left with the Rangers and Cruger captured and the horrific creature Omni, almost complete. Piggy begins to feel badly that he betrayed the Rangers and asks for a sign that he did the right thing. When his café-wagon rolls down a cliff, he knows that he made the wrong choice. Kat and Boom and Omega Ranger rally the rest of SPD into fighting the Troobians. On the Terror, Piggy helps the others escape. Cruger says he must stay and save his wife. He confronts Gruumm and they begin to battle. Gruumm holds Isinia over an abyss, but Cruger is able to save her. Gruumm falls down the abyss. On Earth, the Nova Ranger arrives from the future to help her friend Omega. Suddenly, Omni lands on Earth. His size and power are no match for SPD. The Rangers arrive and fight it with the SWAT Megazord. Kat tells Cruger that he must manually shut down Omni's brain if the Rangers are to stand a shot at destroying him. Risking his life, Cruger does so. Omni is destroyed and Cruger and Isinia survive the explosion. Everyone begins to celebrate when Gruumm appears once more. Cruger is ready to end this battle. He cuts off Gruumm's other horn and confines him forever. The planet is saved. Jack decides to leave SPD to go back to helping the less fortunate with Ally. Sky is promoted to Red Ranger. SPD will go on to protect the Earth from whatever dangers lie ahead. Gruumm holds Cruger captive and reveals that he has his wife, Isinia, as well. He then sends the A Squad to Earth to finish off the Rangers. Broodwing rallies his troops. With Cruger gone and the Rangers occupied, it is the perfect chance to attack the SPD Command Base. Using all his generals and robots, he is able to infiltrate the base. Kat and Boom hold them off the best they can, but Broodwing gains control of the Delta Command Megazord and is intent on destroying the city. The Rangers fight the A Squad as best they can. In the battle, the Delta Squad Megazord is destroyed, but the cadets retrieve the SWAT Megazord from an underground bay. Kat cuts off the power from the Delta Command Megazord. The Rangers defeat and contain the A Team, then stop Broodwing and contain him as well. Piggy tells them that he knows where to find Cruger, but leads them into a trap. The Rangers are captured and brought to the Terror. They are thrown in a cell with Cruger. Gruumm tells them that The Magnificence will soon be complete. Jack meets Ally, a kindred soul who devotes her time to helping the less fortunate. The two hit it off and Jack beings to spend more time with her. Mora and Gruumm continue to prepare the mysterious preparations for their ultimate plan. Delex turns people into battery cells for Broodwing and the other Rangers confront him. Cruger gets angry when Jack doesn't answer his Morpher because he is with Ally and is late to the fight. Delex grows to an enormous size and the Rangers use the SWAT Megazord to contain him. Jack is admonished by Cruger for being late. Jack defends himself, saying he has a life outside of SPD. The Rangers are dispatched to a distant planet to check out a distress signal. They are shocked to discover that the signal was sent by the long-lost A Squad Rangers! When they all return to the Base, Cruger thanks the B Squad for what they have done and dismisses them, leaving them angry and insecure about their stature in SPD. In the Command Center, the A Squad reveal that they are working for Gruumm and they capture Commander Cruger! After overhearing Cruger mention that the A squad might have defeated Gruumm already, our teens can't sleep and are left to ponder their heroic journeys thus far. During the trip down memory lane, the teens figure out that Gruumm is looting the planet of resources to build something...but what? After the teens tell Cruger about Gruumm's plan, Cruger explains his comments about the A squad, settling their nerves before readying the team for battle. Meanwhile, against her wishes, Gruumm has left Mora with Omni. Sky is attacked by an alien named Icthior. Icthior beats him badly and takes his SPD badge. He is brought back to the base and put in intensive care. Cruger is worried and calls the other cadets back, but Syd and Bridge are attacked as well. We find out that Icthior is working with Broodwing. Kat finds out the ID of the attacker and Cruger is shocked to discover that it is his old rival from the SPD Academy. He tells of how Icthior was a dirty fighter and Cruger's rival for Isinia's affection. Isinia chose Anubis and Icthior has never forgiven him. Gruumm sends Morgana to steal a synthetic plasma while the Rangers are occupied. Omega volunteers to draw Icthior and is attacked. Shadow Ranger shows up and confronts his old rival. Icthior taunts Shadow with a memory of Isinia and gets the best of him in the fight. Sky, Bridge, Syd and Cruger lay injured in the infirmary and the doctor orders them to stay there. Jack and Z defy Cruger's order and go out to find Icthior. Soon, they find themselves way over their head. The others rally and arrive to help. The team fights with all their remaining strength and the foes are defeated. Before Cruger contains Icthior, Icthior tells him that Isinia is still alive! Morgana returns with the plasma and Gruumm rewards her by turning her back into little Mora. Commander Birdy offers Kat the position of Chief of Technology at the SPD HQ. Kat asks for time to think it over. When Boom tells the Rangers, they are sad that they might lose their friend, but realize this is a once in a lifetime opportunity for her. Z comes up with a scheme that will convince Kat that she is no longer needed. The plan works and Kat leaves. Although Boom tries his best to fill her shoes, things quickly begin to go wrong at the Base. Meanwhile, an old classmate of Kat's, Mooney, is working with Broodwing and has built the Gigabot, a robot that the Rangers can't defeat. At SPD HQ, Kat finds that her new position is mainly paperwork. When she finds out that the Rangers are in trouble, she asks Birdy if she can go back to Earth and help them. He is reluctant, but gives her a special temporary Morpher to take with her. The Rangers continue to battle the Gigabot, but discover that his power source could blow at any minute. Kat arrives and morphs into the Kat Ranger. She stops Mooney and Broodwing and the Rangers are able to stop the robot safely. The Rangers admit they really do need Kat and she is happy to return to the Base. Bridge dreams that he and the Rangers are fighting three robots at once. The next day, Gruumm sends a robot to attack the city and the Rangers must stop it. Meanwhile, Broodwing blackmails three old acquaintances into helping him defeat the Rangers. Gruumm attacks again, barely giving the Rangers a chance to catch their breath between battles. Bridge has the same troubling dream. He leaves and goes to the location in his dream. There he encounters Broodwing's gang. He tries to take them in, but they won't go without a fight. The other Rangers join in and when the thugs take the fight to a giant robot, Kat tells the Rangers that she has a new Megazord for them, the SWAT Megazord. Using this amazing machine, the Rangers are able to dispatch the enemies. Gruumm begins to get suspicious of Broodwing's loyalty. Sky feels horrible that Mirloc was able to escape because of him. Mirloc makes an alliance with Gruumm and promises to catch the Rangers for him. He captures all but Red and Omega in his mirrored dimension. When a giant robot attacks, Red takes the Omegamax Zord to fight it, but it too is captured by Mirloc. Omega faces Mirloc and is able to free the Rangers. Mirloc taunts Sky about his father again. The others stand up for Sky and Jack says that it's only right that Sky bring Mirloc in. He gives him his Morpher and Sky morphs into Red Ranger. Using the Battlizer, Sky captures Mirloc. He is sent to a planet where he can never escape again. Sky knows that his father would have been proud of him. The other Rangers are jealous when Cruger seems to be devoting more of his attention to the Omega Ranger. Morgana approaches Mysticon, a failing magician and makes him an offer he can't refuse; a real magic wand. Mysticon takes the wand with the promise that he will do a favor for her someday. With the help of his assistant, Al, Mysticon goes on a crime spree. Al is capture by SPD and tells them that Mysticon is working with Morgana. Cruger tells Omega to check it out. The others feel neglected and go on their own to investigate. Syd poses as a magician's assistant, but her cover is blown by Morgana. Mysticon puts Syd under his power. During the big magic show benefit, Morgana plots to capture a famous scientist in the audience. The plan is foiled by the Omega Ranger. Mysticon attacks in a giant robot and the Rangers combine their Zords to form the Deltamax Zord to defeat him. The cadets realize their jealousy of Omega was unfounded and they are all important members of the team. The Megazord battle with Devastation is looking dire for the Rangers. Suddenly, an amazing new zord, the Omegamax Cycle comes to the rescue. Shorty is destroyed. The driver of the Zord is the Omega Ranger. He battles Devastation and Morgana with his powerful skills. The villains retreat. The Rangers want to know who this new Ranger is. Back at the base, the Omega Ranger tells them that he has come from the future to prevent the destruction of the others. The cadets are grateful, but when Morgana and Devastation return, the Omega Ranger insists on facing them himself. He is certain that the technology from the future is superior to SPD present-day vehicles and weapons. When he confronts Morgana and Devastation again, they are more powerful than he thought and he gets in trouble. The others come to save him. He realizes that courage and determination are the keys to winning the battle. The Rangers use their Megazords to defeat Devastation and Morgana returns to The Terror in defeat. The Rangers are shocked to learn the Omega Ranger is actually their friend Sam, the little boy they had befriended earlier. They invite Sam to stay with them until Kat can find a way to get him back to the future. Boom intercepts a radio transmission from the future which states that the Power Rangers have lost the battle for Earth to Gruumm and his army. Although this is very serious news, the cadets decide that they must keep fighting until the end. Morgana has proven herself to be a fearsome fighter and promises to bring down the Rangers with the help of two friends. The first friend, Shorty, is a rough and tough alien bent on destruction. When he attacks the city, the Rangers try to stop him. The battle escalates and Shorty sends for more help. His brother, Devastation is summoned. Devastation's power is too much for the Rangers and when the fight goes to the Megazords, Devastation threatens to destroy them. Unless the Rangers get a miracle, the message from the future will come to pass. The Rangers are dispatched to stop a theft at the World Gold Depository. They are successful in apprehending the criminal. Cruger asks the Rangers to report on how the situation went down. The cadets all begin to speak at once. Cruger tells them to each explain what happened. One by one, the cadets tell him their version about the incident, and as it turns out, the one telling the story just so happens to be the hero of the day. Kat brings up a surveillance tape that reveals the truth. A mysterious spark of energy is actually what tipped the scales and helped the Rangers win. The Rangers continue to argue about what happened while Cruger wonders what this strange spark might be. The Base gets a visit from the Supreme Commander of SPD Headquarters, Commander Birdy. Birdy is a strict and hardnosed leader, who finds fault with the way Cruger commands the Rangers. When Cruger refuses an order, Birdy fires him and takes his place. Green, Blue and Red Rangers are sent out to investigate a massive spike of evil energy. To their shock, they encounter Emperor Gruumm himself! The three Rangers are beaten and given a message; Gruumm has come to Earth to battle Cruger. When Birdy finds out that the Rangers lost to Gruumm, he goes to fight him himself. He turns out to be no match for Gruumm and soon finds himself in big trouble. Cruger is persuaded to come back. While the Rangers fight an evil alien, Cruger saves Birdy using a new Shadow ATV. Birdy goes back to SPD with new respect for Cruger and his team of Rangers. The cadets and Cruger strategize on how to rescue Kat. Cruger finally tells the cadets that he lost his wife, Isinia, in the Battle of Sirius and General Benaag led the Troobians. Benaag reveals that he has Kat and challenges Cruger to come and get her. Cruger orders the Rangers to deal with the earthquake spikes throughout the city, he will deal with Benaag. Kat is held in a dangerous device that will destroy her. Cruger shows up to save her, but Benaag has set a trap. He deploys one hundred Krybots to stop him. Cruger takes out a gift from Kat, a special Morpher. He morphs into the Shadow Ranger. Using his amazing skills, he destroys the Krybots, then General Benaag. The Rangers are able to stop the robot from triggering the earthquakes. Cruger saves Kat's life and vows that as Shadow Ranger, he will continue to soldier on in the fight against evil. Cruger is haunted by nightmares of the Battle of Sirius, the fight where Troobians conquered his home planet. He becomes irritable toward the Rangers. He apologizes and tells them the story of how he lost everything that day. Meanwhile, Piggy finds a winning lottery ticket and buys a café that feeds all the lowlife of New Tech City. Gruumm's henchman, General Benaag comes to the café and gives the cadets a message for Cruger; he challenges him to a battle. Cruger says he won't fight; he has hung up his sword forever. Gruumm comes to Earth disguised as a human. A robot enacts a plan to set off a series of Earthquakes. The Rangers are sent to deal with the robot. After having a fight with Cruger, Kat leaves the base and is captured by Benaag. Syd has big plans to celebrate her birthday, but Jack disrupts them by assigning her to work a stakeout with him. Jack doesn't understand why Syd is so upset. The two cadets must observe the laboratory of Dr. Rheas, a scientist who was partners with an alien named Sinuku. Sinuku began making weapons for the evil side and was sent to prison. He escaped and Cruger thinks he might try to contact Dr. Rheas. Syd is miserable on the stakeout and Jack is insensitive to her feelings. He doesn't understand why she's making such a big deal of her birthday, and then confides that he doesn't know when his is. Syd realizes why he's been so cold. Sinuku captures Dr. Rheas and gets her to bring him to where a weapons activator is hid. The Rangers confront him, but he deploys a giant robot. The Rangers call the Megazord and defeat the robot. Sinuku is recaptured. Jack throws Syd a surprise birthday party and Syd invites him to share her birthday with him. The Rangers are sent out to investigate a spacecraft that has crash-landed on Earth. Sky is surprised to find out that the pilot is Dru, his best friend from the SPD academy. Dru tells the others that he has been on a top secret SPD mission. Jack is a little skeptical, there are some points in Dru's story that just don't seem right. Dru defends his friend and gets angry with Jack for suspecting him. Dru morphs into a monster, Gigantis, and attacks the Rangers. Jack accuses Dru and is proven right. Sky takes the blame for letting an infiltrator into the base. Just then, Gigantis blasts Cruger, but he recovers. Sky is crushed that his friend would betray him. Gigantis grows and the Rangers use the Megazord to beat him. Sky knows what he must do and arrests Dru once and for all. Jack and Z leave the others to fight the Krybots, but even with their Ranger powers, Blue, Pink and Green Rangers have a tough time. Jack and Z go back to help and together, they defeat the Krybots. However, the two thieves are still taken into custody by the SPD cadets. Cruger sees potential in Jack and Z and offers them positions on the B Squad to atone for their crimes. Z takes the offer, but Jack turns him down and is put in confinement. The others bring the Proton Accelerator to Piggy to find out what it is and are attacked by Krybots. Jack finds out that they are in trouble and decides he must help. He shows up at the fight and morphs into Red Ranger. Broodwing, an opportunistic alien who is working for Gruumm, sends a giant robot to attack. The A Squad Rangers fight it with the Delta Squad Megazord. The A Squad Rangers win and Jack decides to join the B Squad. Years in the future, a war-torn space battleship destroys a ravished planet. Emperor Gruumm, the commander of the ship, orders his crew to head toward Earth. Earth bustles about with aliens and humans living together in harmony. Under the command of Anubis "Doggie" Cruger, a highly trained unit of police, the Space Patrol Delta, or S.P.D., has been formed to keep the peace. Three young cadets who comprise the B Squad- Sky, Bridge and Syd, train using special powers. They hope to someday work their way up to the A Squad, the elite team of cadets who are the Power Rangers. Meanwhile in a run down part of town, we meet Jack and Z, two young thieves who have spent their lives helping the less fortunate of the city get clothes and food. The B Squad is sent to investigate the two thieves, but Jack and Z elude them, displaying special powers as well. Cruger finds that Gruumm is heading to Earth and gives Sky, Syd and Bridge S.P.D. Morphers. To get his ship into the Earth's atmosphere, Gruumm needs a Proton Accelerator. The device happens to fall into the hands of Jack and Z. The three cadets confront Jack and Z again, but the group is attacked by Krybots, Gruumm's legion of Troobian foot soldiers. Seeing a chance to escape, Jack and Z flee the scene, leaving the others to fight the Krybots. Power Rangers SPD is currently available to watch and stream on Saban. 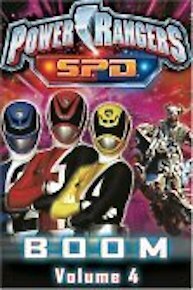 You can also buy, rent Power Rangers SPD on demand at Netflix, Amazon, iTunes online.